Product prices and availability are accurate as of 2019-04-14 02:05:52 EDT and are subject to change. Any price and availability information displayed on http://www.amazon.com/ at the time of purchase will apply to the purchase of this product. OBERLY was born out of a simple vision: Take the benefits of a blender on the go! We created a small power-machine that lets you make fresh smoothies, shakes, or baby food wherever you are. 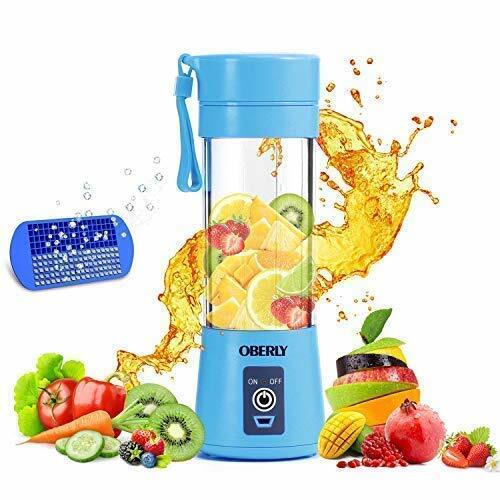 OBERLY Portable Blender realized real portable thanks to its USB rechargeable and cute body. Not like plug-in blender, pour juices from one cup to the other, and bulky base are not be carried either. Don't put your hands inside your blender or try to touch the blades. Don't use your blender when charging or run your blender without anything inside. Don't recommend hot liquids over 50 degree which will be easy cause damage or leakage. Charge your blender before your first use. The lights turns red while charging and blue once full charged. Recommend cutting your fruit or other ingredients into small chunks. Always start by adding a liquid such as water or milk. You can blend ice. Make sure your blender with sufficient liquid inside first, and that your cubes aren't too large. Red and blue flashing lights mean your jar isn't aligned with your base. To fix this, the arrow on the jar should line up with the switch on the base. Red flashing lights mean your blender needs to be recharged or that your blades are blocked. Recharge or shake your blender. Small but mighty powerful: This powerful battery-operated blender can produce 10-12 cups per charge. Simply charge via USB port 2-3 hours before initial use, then add your ingredients and power-on for a tasty smoothie or shake in 90 seconds. Simple and safe to use: Single-button operation makes this portable blender quick and easy to use. Built-in safety features prevent overheating and also ensure that the unit will not operate if components are improperly assembled. Durable and built to last: Made from high-quality BPA free and food grade materials, featuring a durable 6-point 304 stainless steel blender blade and 2000mAh battery powering a 3.7V motor, this powerful smoothie blender is not a toy. Goes wherever you go: This compact lightweight blender is ideal for tucking into a gym bag, briefcase or purse so you always have a healthy option wherever you are. At 3 x 3 x 9 inches, this cordless travel blender is easy to store when not in use. Portable and Multi-functional: This smoothie blender can crush ice, frozen fruits, seeds, stem, vegetable very well, and get delicious silky smoothies shakes all in 20 seconds. Its very portable for traveling, camping, fishing etc outdoor.